Our inn near Asheville, North Carolina is an ideal choice whether you are looking to get away to enjoy life’s simple pleasures of beautiful natural surroundings and seclusion, or to experience the many cultural and tourist experiences in the area. 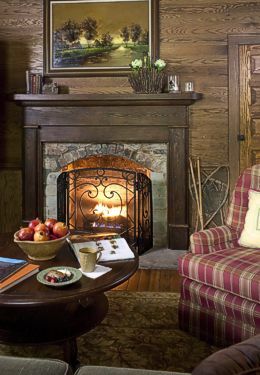 Surrounded by a conservation of 750 acres of the majestic Blue Ridge Mountains, the inn is nestled along the banks of Bald Mountain Creek, which can be heard from most of the property’s eight acres, especially while relaxing on our wraparound porch. Conveniently located near Burnsville, North Carolina, 27 miles north of Asheville, The Buck House Inn on Bald Mountain Creek is the perfect setting for a retreat, a family reunion, or a romantic getaway. The Buck House Inn on Bald Mountain Creek will operate seasonally, Spring through Fall. Innkeepers Debbie and Sam Stebbins have a passionate desire to offer you the best in service and hospitality. Our goal is to provide you an opportunity to disconnect from your routine or hurried lifestyle and reconnect with yourself, a loved one, God, or all three in comfortable accommodations amid the mountain splendor. The Buck House was built as a residence in 1904. The original chestnut walls, ceilings and floors have been restored and modern amenities added. It is listed on The National Registry of Historic Places, along with several historic outbuildings and structures. The inn has four bedrooms, all with private bathrooms and luxurious linens. Some of the rooms have fireplaces with gas-burning logs. Free Wi-Fi is available throughout the inn. 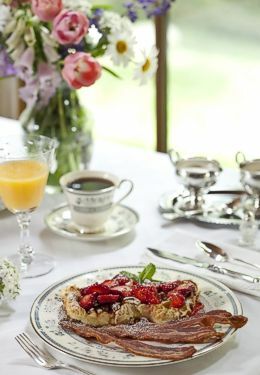 Breakfast is served in the dining room where you may choose a small, private table or large table with other guests. There is also seating available creekside on the veranda. The ever-changing breakfast menu will include fruit, a hot entrée, side of meat, and homemade bread. 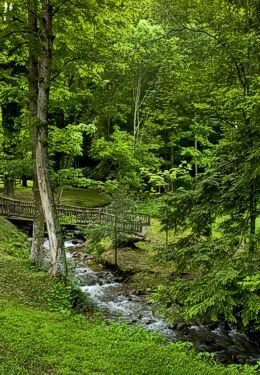 The mountain offers you a choice of activities: hiking (access to the Appalachian Trail), horseback riding, golf, fishing, and casual or fine dining at Wolf Laurel Country Club. In nearby Asheville, you can visit The Biltmore Estate, art galleries, antique and other shops. Shopping can also be found on the square in Burnsville. Thanks for checking us out. We would love the opportunity to pamper you in our little piece of heaven. Hope to see you soon! As season six comes to a close, we wish to thank all our guests who’ve made this such a wonderful year. The off-season is our time to rest, relax and prepare the Inn to welcome guests again when we open back up May 1, 2019. When it’s time to schedule your R&R we hope you’ll do it here on the mountain with us. It is always our honor to serve you. Our online booking never goes on vacation, so you can make your reservations anytime. Or for assistance, call (828) 536-4140.